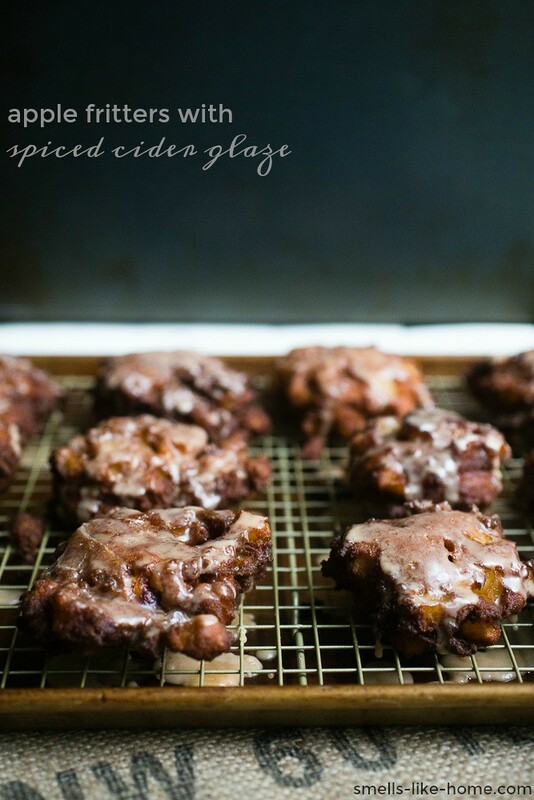 Apple fritters with spiced cider glaze: A nutty, cinnamon-y whole wheat batter chocked full of sweet Honeycrisps, fried, and glazed with spiced cider glaze. Deep into fall now, I’m in constant awe of the level of beauty at every turn. My yard, a mature forest of maple, oak, hickory, and beech trees, gives off a golden glow this time of year that just takes my breath away. Even the morning light, normally hosting a blue hue, comes through like a sunset from the opposite side of the horizon. And with October, of course, comes all of the good things from the kitchen too, am I right? Last weekend, we dove into some apple fritters. This was a treat Kyle has been begging for since last winter and one I have been begging him back to wait until fall apples arrive. They were worth the wait, indeed! A nutty, cinnamon-y whole wheat batter chocked full of sweet Honeycrisps (whatever you have on hand will be fine), fried, and glazed with a spiced cider glaze, these apple fritters killed it. The recipe makes 10 good-sized fritters and somehow, over the course of the day, they all disappeared. How that happens, I’ll never know! OK, well, actually, I DO know. Sorry not sorry. 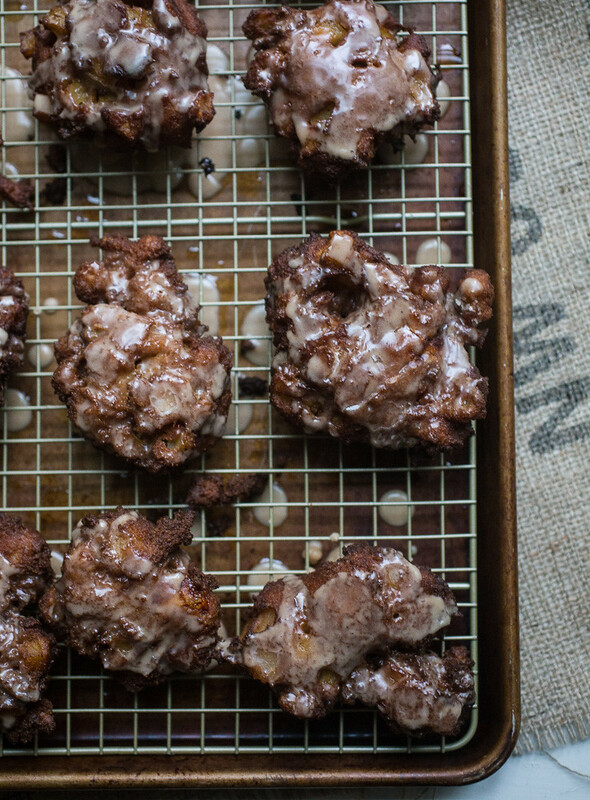 So, if you’ve been apple picking and ended up with 10 more pounds apples than you know what to do with, consider pulling a few out for these fritters. 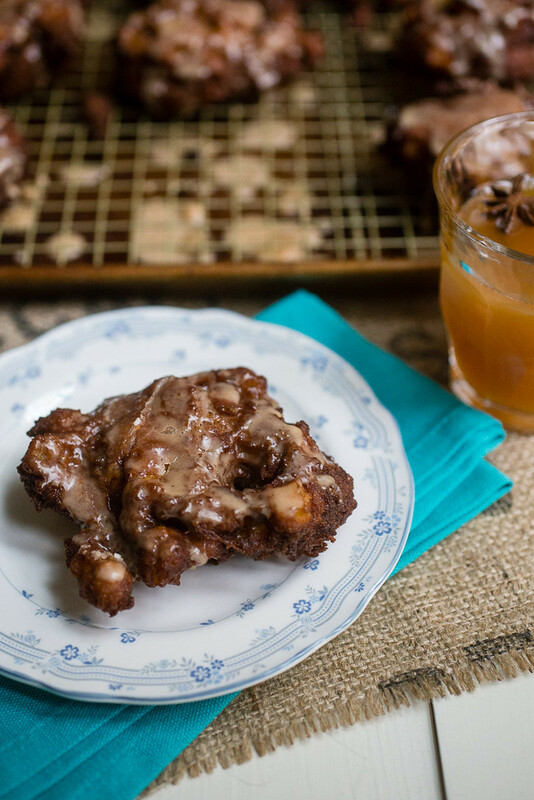 Homemade applesauce, apple butter, and slab pie have their place, but apple fritters with spiced cider glaze? October perfection right there. I’m also so glad I live in a world where there are Octobers! Spread apples out on a long piece of paper towel and pat dry. In a large bowl, whisk the flour, sugar, baking powder, salt, cinnamon, and nutmeg together. In a 4-cup liquid measuring cup, warm the apple cider in the microwave for 30 seconds. Whisk in the eggs and butter until combined. Toss the apples in the dry ingredients until well-coated. Stir the wet ingredients into the bowl and mix with a rubber spatula until incorporated. Place a wire rack in a large rimmed baking sheet. Heat 3 cups of oil in a large dutch oven to 350° F. (A candy thermometer clipped to the side of the pot works great here.) Using two large soup spoons, scoop about ½ cup of the batter up with one spoon and using the other spoon, slide the batter into the hot oil. Gently flatten the batter against the bottom of the pan. With a wide pot, you should be able to fit 3 or 4 fritters. Fry for 1 ½ to 2 minutes then flip and fry for another 1 ½ to 2 minutes. Adjust the heat as needed to ensure the temperature of the oil stays between 325° F and 350° F. Fritters should be a deep brown; if they’re cooking too fast, adjust the heat and/or reduce the cooking time. Add extra oil as needed to the pot if it starts getting low or your thermometer tip is no longer immersed in the oil. With a spider spatula/strainer or wide-slotted spoon, drain the fritters over the pot and transfer to the wire rack. Cool for 5-10 minutes. While the fritters cool, make the glaze by whisking all of the glaze ingredients together in a medium bowl until smooth. Drizzle 1 tablespoon over the top of each fritter. Allow glaze to set for 10 minutes before serving. Those sound amazing! Apple fritters are one of my favorite treats, but I’m so often disappointed by the ones in a grocery store display case that have no flavor. I bet these are delicious. Baking with apples is one of my favorite parts of fall. Yum! These look perfect!! I haven’t had an apple fritter in forever!